Biasa Artspace has been missing its mojo for months, during the extended absence of its founder, Susanna Perini. For most of 2010, a bevy of guest curators stepped in to keep the Biasa heart beating (“paddles, clear!”), with a round of satisfactory exhibitions – – most recently On Camera, a show by Indonesian photography collective MES 56. While the show as a whole was out of focus, we found a few of the images oddly haunting. Foremost among them was Agung Nugroho Widhi’s Capturing a Moment in a Windy Garden Party, an archival print mounted on aluminium (detail above). 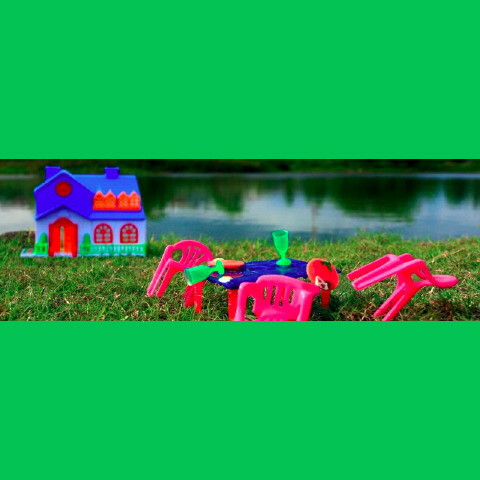 Here tiny toys poignantly evoke the disaster of the Suburban Dream in poison plastic colours. The most cherished ideals of Indonesia’s aspirational middle class are exposed as nothing more than toxic trash, a sham, a cheap trick foisted on them by toy sellers. And the absence of people (or dolls) amid the tipped chairs and glasses smells like a neutron bomb. Yet there remains some solace here. Arcadia, although abandoned, is seen to persist in a natural landscape reflected upside-down in a pond, which fills the far background. The scale of Widhi’s print, at 131cm, gives the piece extra punch. Go see it for yourself; the show is up until mid-February, so you can find the time. I’m sure of it. The only other thing hanging on Biasa’s walls that demanded attention was an image by Wok the Rock, unidiomatically entitled Embed Ghost. It’s a chapel-ready rondel of Indonesia’s unexorcised demon, Soeharto, which is frankly, chilling. The icy sheen of this UV print on an acrylic mirror contradicts the subject’s ostensibly benevolent smile and gesture, giving the work a peculiar potency. As we approach it, from ten meters distant, we begin to experience the grip of an irresistible terror that is felt in the body, rather than seen with the eye. And yet we are drawn to it, and cannot help approaching it, closer, closer, closer, only to stand in a state of bewildered awe in its presence (above). Offered in the form of an icon, this news shot of Pak Harto brings to mind the medallion of a cherished saint, or the locket picture of an adored dead relative worn on a chain over one’s heart. It feels distinctly cultish. And complex. And brutally ironic. And it probes the true nature of media icons deeper than Warhol ever dared to. Certainly, the work references religious art, but this is a religion that inspires horror and devotion in equal measure. How better to immortalise such a man? At 50cm in diameter, the scale of the image renders it personal and preternatural at the same moment. Oh, and given the level of detail, you can read Soeharto’s palm if you are so inclined (I did, but I’m not telling). His pose here, in what is clearly an abhaya mudra reminds me of the Sai Baba pictures we’ve all seen framed on walls and worn as photo-buttons by devotees. Very creepy. The vernissage of On Camera was sparsely attended, at least in comparison to other Biasa openings in the past. Perhaps it was the season. Perhaps it was the plethora of other openings and events the same evening. Perhaps it was the absence of Susanna Perini, whose imminent return to Bali is awaited with bated breath. For the first time at any Biasa opening, there was space to see the art and we weren’t sweltering in a crush of people. That’s me (above), talking with Lombok artist, Karyana (an extraordinary autodidact). At right in white is Belgian metteur en fête Eric Van Bruggen with fellow Belgian visiting Bali, Eleonore De Liedekerke. Shortly after the picture was taken we were off to Deus Ex Machina in Canggu for the opening of their Christmas art show . . . . more on that in a minute.